Tag Archives for " Builder "
The new theme is part of a complete overhaul here at Duct Tape Marketing to create a better reading environment as well as a more structured explanation of what the heck goes on around the Duct Tape Marketing System and Consulting Network. I am also moving the entire site onto WordPress, not just the blog. Even though I’ve got hundreds of static pages built up over ten years of creating content, it’s still the best way to go in the long run. The redesign process was started with a design contest on Crowdspring. I offered a very fair prize (as in fair to designers) and received significant interest to draw from. The theme is Builder from iThemes and tricked out by the iThemes team to help show how much flexibility this bad boy has. I can’t thank Cory and Chris at iThemes enough for taking this project on. 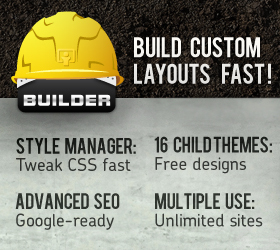 I love Builder and think it is absolutely designed for the user that wants total freedom to create many templates for many uses. I still have a lot of work to do on the page conversions, speed work, and tweaking to do as well as a fair amount of redirect work to keep the Google happy, but I would love to hear your initial thoughts.